Your Phoenix-area home runs on electricity. When there is a higher demand for your devices, less energy is dispersed to your outlets and switches. Older homes are especially prone to this since aged electrical panels typically only produce up to 80 amps. Residential electrical panels available today can provide up to 200 amps throughout your home. Demand problems are the leading causes of flickering lights, unexplained power outages, and temperament light switches. It can also be the source of a faulty circuit breaker. More serious indicators for residential electrical panels are blown fuses and tripped breakers. If either of these happens, our highly-recommended electricians can determine the cause of the problem by completing a panel or breaker evaluation. The Mighty Electricians are licensed professionals that provide electric panel upgrades and replacements for Phoenix-area residents. We will inspect your existing residential electrical panel and advise on recommended fixes or upgrades. Our goal is to help your home efficiently distribute energy to all your outlets and switches for less. We are here to help you stay powered on all throughout your home. 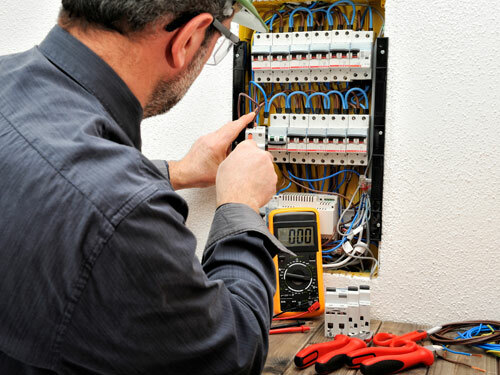 Before you find yourself without power, hire The Mighty Electricians for a circuit breaker inspection. We are available 24/7 to provide scheduled and emergency electrical services throughout Phoenix, AZ. We do everything from light fixture installations, complete rewiring, and circuit breaker replacements. Contact us today for a consultation for your next panel or circuit breaker upgrade.